Spread the word. 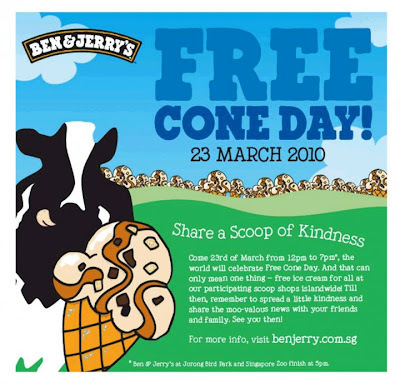 March 23, 2010 is FREE CONE DAY at selected Ben & Jerry's stores in Singapore. This is a great opportunity to try out all those flavors that you've never tried before AND IT'S FREE!!!!! Note: Ben & Jerry's at Jurong Bird Park & Singapore Zoo finish at 5pm.